Local Woolies has Vodafone Pocket Wifi 4G modems for half price. Currently $29, was $59 and comes with 5Gig of data. Don't know if it's national or for how long this offer lasts. 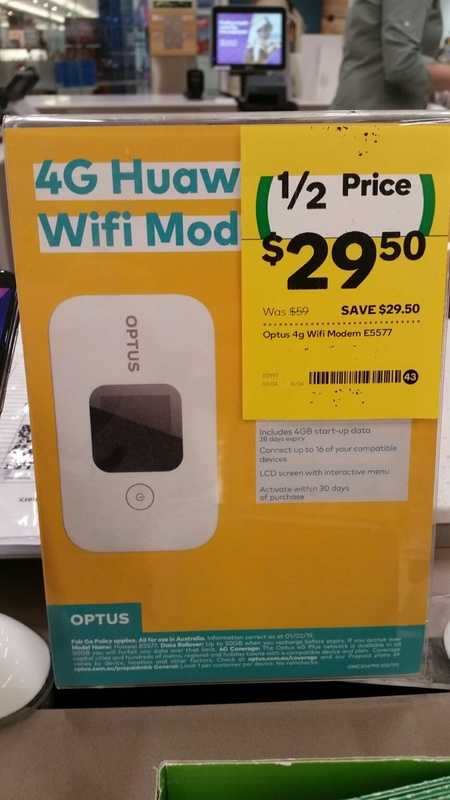 Local Woolies has Optus Wifi 4G modems on offer for half price. Looks to be the same as the recent offer form Coles around three weeks back. These also come with 4Gb of data and you can connect up to 16 devices simultaneously. Don't know if it's national or for how long this offer lasts. Do either of these have a Ethernet port? No Ethernet port on either of them. I have the optus one and its just hopeless…. even the 3G Vodafone worked better. Are they locked? Before, I bought Optus Huawei E5573 which is unlocked. Optus E5577 (the new Optus one sold at Woolies, Coles etc) is locked. Using optus sim in the voda fine then? These are available country wide. Bought one in Qld. Thank you for the information!